You can see list of our Aerofit HF942 VS Cosco CET-TRIM-500 E below, perform Side-by-Side comparison. If you need further help, do have a look at Conzumr Guides and Tips. Alternatively you can view all Cross Trainer/Elliptical to choose your own favourites. Elliptical Trainer with 8 kgs. Heavy Flywheel, 8 level magnetic Resistance, Large Non-Skid Foot Pedal, Big LCD Display. 14” Inches natural strides. AF 528ES : 14” Inches natural strides. Self balancing, close spacing, enlarge, impact-absorbing and fit to any size user. AF 528ES : Self balancing, close spacing, enlarge, impact-absorbing and fit to any size user. In-built pulse sensor with front handle grips enables to the cardio monitoring on board. AF 528ES : In-built pulse sensor with front handle grips enables to the cardio monitoring on board. Multi feedback read out instantly displays time, distance, speed, calories, odo and pulse. AF 528ES : Multi feedback read out instantly displays time, distance, speed, calories, odo and pulse. Arched support frame for maximum durability and stability. AF 528ES : Arched support frame for maximum durability and stability. Elliptical Trainer with 8 kgs. Heavy Flywheel. 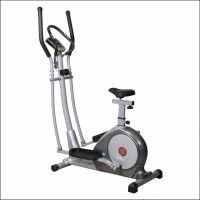 CET-TRIM-500 E : Elliptical Trainer with 8 kgs. Heavy Flywheel. Centre design drive, super silent poly-V belt driven. AF 528ES : Centre design drive, super silent poly-V belt driven. Low COG combined with a balanced frame prevents rocking. AF 528ES : Low COG combined with a balanced frame prevents rocking. Time, distance, calories can be set as per user requirements. AF 528ES : Time, distance, calories can be set as per user requirements. Proprietary two coat powder process. AF 528ES : Proprietary two coat powder process. All frame structures electro statically powder coated to ensure maximum corrosion and chip resistance. AF 528ES : All frame structures electro statically powder coated to ensure maximum corrosion and chip resistance. 66 " AF 528ES : 66 "
1570 " CET-TRIM-500 E : 1570 "
46 " AF 528ES : 46 "
1250 " CET-TRIM-500 E : 1250 "
24 " AF 528ES : 24 "
570 " CET-TRIM-500 E : 570 "
Pop-pin seat slider horizontal and 6 steps vertical adjustments deliver a great fit. AF 528ES : Pop-pin seat slider horizontal and 6 steps vertical adjustments deliver a great fit. To Recieve updates and possible rewards for Cosco CET-TRIM-500 E please sign in. To Recieve updates and possible rewards for Cross Trainer/Elliptical please sign in.